The Funeral Mass to celebrate the life of Miss Mary (Marie) Boyle will be held at St Cecilia's Church, 47 Peebles Rd, Floreat on MONDAY (15.4.2019) commencing at 11am. After the Mass the Cortege will assemble at the main entrance of KARRAKATTA Cemetery at 2pm for a Cremation Service. 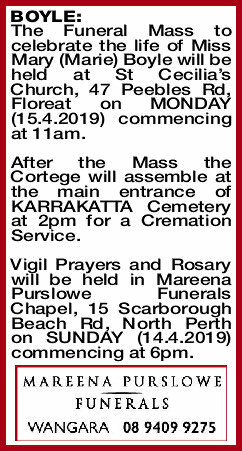 Vigil Prayers and Rosary will be held in Mareena Purslowe Funerals Chapel, 15 Scarborough Beach Rd, North Perth on SUNDAY (14.4.2019) commencing at 6pm. It’s been a privilege knowing you, my lovely neighbour, Marie. I’ll miss you and your friendly greetings and happy nature. Deepest sympathy to Allan and your overseas family. Farewell my Darling, you are now at rest. You put up an amazing fight right to the end. You will be so sadly missed by all who knew you and the family back home. I am going to miss those wonderful years we spent together. Rest peacefully Marie. Allan.